The Larson Electronics EPL-SL-5-LED-TXF Explosion Proof String Light set with stepdown transformer is approved Class 1 Division 1 Groups C and D - and is ideal for general close work and inspection activities in hazardous locations requiring explosion proof protection. This explosion proof string light has ten low voltage explosion proof drop lights spaced ten feet apart and an encapsulated step-down inline transformer. This explosion proof string light set from Larson Electronics contains a total of five low voltage LED 10 watt work lights equipped with aluminum hooks and connected in series along 40 feet of 14/3 SOOW explosion proof cord. A molded T junction is mounted every ten feet, with 3 feet of 16/3 SOOW cord connecting a single drop light to the backbone. A 25 foot tail section of main SOOW cord is included to allow ample length for connection to the inline stepdown transformer. The transformer is encapsulated in a NEMA 4X enclosure, is equipped with a 10 foot line in cable, and equipped with an industrial grade plug. This unit incorporates ten explosion proof LED hand lamps connected in series and is suitable for use in areas where petrochemical vapors and various dusts are present. The machined aluminum housings, cast aluminum guard, tempered glass lamp globe, and abrasion resistant cord make this a very durable unit that will resist damage from chemicals, abrasion, vibrations and impacts. This string lighting solution will provide the lighting you require in a flexible, easy to manage configuration. 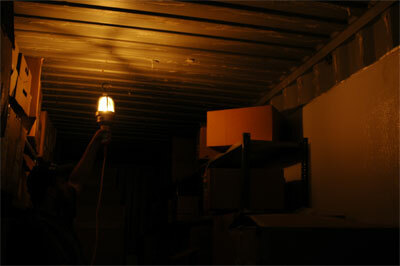 The hand lamps can be moved around and hooked to different points on your scaffold. The lights, however must remain within 10 feet of one other. Each molded T section contains a hook eyelet, allowing operators to suspend the entire backbone off the ground and out of the work space. This stringer light set is Class 1, Division 1 rated for Groups C and D and Class II, Division 1 Groups F and G. This unit is multi-voltage and configured to operate on 120-277V AC stepped down to 12V or 24V DC, please choose your configuration below. Wiring: This unit is equipped with SO cable leading to an encapsulated step down transformer. There is ten feet of 16/3 SO cable coming out of the inline transformer, and is terminated in an industrial grade cord cap. This inline power supply for this LED string light is an auto sensing universal voltage transformer that operates on any voltage within the 100-277 volts AC 50/60Hz range. This unit allows operators to power the string light from any 120-277V AC power source, and steps down AC voltage to 24V DC. Plug options include standard 5-15 straight blade plug for 110V wall outlets with ground, NEMA L5-15 twist lock plug for 125V twist lock outlets, NEMA L6-15 twist lock plug for 240V twist lock outlets, BS1363 3-blade plug for United Kingdom outlets, and a two pin Schuko plug for European outlets. 3. 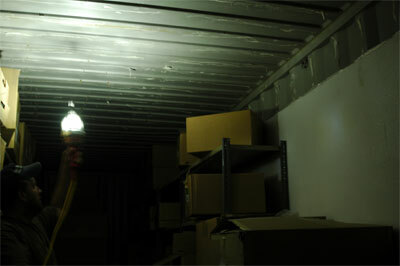 Total of (5) 10 watt LED Lamps.